These are world premiere recordings, and the programme also lays claim to being "the world's first chamber orchestra recording featuring a full program of music with shakuhachi and koto." 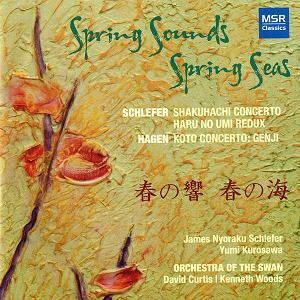 The CD title is a reference both to the Orchestra of the Swan's 'Spring Sounds Festival' and a translation of the opening work, Haru No Umi, into English: 'The Sea in Spring'. Composer James Nyoraku Schlefer is founder of the not-for-profit Kyo-Shin-An Arts, an organization "dedicated to the appreciation and integration of Japanese musical instruments in Western classical music." Kyo-Shin-An commissioned Daron Hagen's Koto Concerto, his first venture into the exotica of non-Western instruments. Schlefer, on the other hand, has a close and longstanding relationship with Japanese culture - 'Nyoraku' ("like the essence of music") is a name acquired through intensive training and study in traditional music. This CD offers an accessible introduction to the timbral and expressive capabilities of the traditional shakuhachi and the 20-string koto, as interpreted by contemporary, but decidedly audience-friendly, American composers also employing normal occidental forces. Schlefer's three-movement Shakuhachi Concerto is subtly scored for strings, harp and percussion, with a 'semi-solo' role played by the shakuhachi, an end-blown flute frequently heard in film music wishing to evoke Japan, China or Far Eastern religions. Schlefer is an accredited shakuhachi 'Grand Master', and the Concerto consequently has little time for pseudo-ethnic flutterings. Instead, this attractive, highly approachable work - mainly contemplative, sometimes almost static but with bursts of strong rhythmic energy - exhibits considerable craftsmanship and no little artistry. As a performer, Schlefer's mastery of what is a very difficult instrument to play well is awe-inspiring, as a superb high-definition YouTube video of this very recording on his website demonstrates. The subtitle of Daron Hagen's Koto Concerto is a reference to the 11th-century 'Tale of Genji', a longwinded romance involving a royal son made commoner through political shenanigans who falls in love with a girl about whom he knows only that she plays the koto divinely! With Hagen eschewing direct extra-musical narrative, the Concerto's five sections capture various psychological states from the story, although the overall feel is a generally cheery one, ending in consummation - or, as the story discreetly puts it, 'Vanished into the Clouds'. For anyone interested in hearing the zither-like koto played both virtuosically and expressively, this is a work to experience. Hagen's colourful, lively writing for orchestra pushes things along, skilfully and tunefully blending Japanese and American styles. Yumi Kurosawa, young but immensely experienced, is a koto player par excellence. In 2009 she debuted with a solo disc of her own pieces for the 21-string koto, a so-called 'world fusion' collection aptly entitled 'Beginning of a Journey' and available through her website. Her performance here can also be viewed, in another splendid high-definition YouTube video this time on Hagen's website. The same page embeds another video of the String Quartet version of the Concerto (this one albeit currently unavailable). In either version - there is also one for large orchestra - this work merits a regular spot on concert programmes, offering a nearly ideal introduction to Japanese instruments for Western audiences. Both shakuhachi and koto appear together in the CD opener, Schlefer's very recent Haru No Umi Redux. The 'redux' is an indication of the fact that Schlefer has reworked the quasi-traditional Japanese New Year's tune, Haru No Umi - actually composed by Michiyo Miyagi in 1929 - adding some of his own material with a light string orchestra backing. Redux is a lovely, thoughtful piece made up of several equally atmospheric solo, duo and tutti sections. The still-underrated Orchestra of the Swan are having a busy time of things at the moment - this is already their third release of 2012, following two Avie CDs pairing symphonies by Schumann and Hans Gál (review, review). They were led in those recordings by the even more prolific Kenneth Woods, who, as part of his ongoing advocacy of Gál and wearing his cellist hat in the Ensemble Epomeo, has just had another Avie disc released, featuring both the composer's String Trios and a couple of shorter works by Hans Krása (AV 2259). For Woods and the Swans the present disc will surely add to their growing reputation for measured, quality interpretations, as well as a laudable, healthy interest in music that without their intervention would probably languish unjustifiably in dusty library basements. Whilst Woods is Principal Guest Conductor of the Orchestra, David Curtis, who steps in for Hagen's Genji, is actual Artistic Director and has established the ensemble as a champion for living composers, many of whom they have commissioned. In many ways he cuts a similar figure to Woods - confident, relaxed and thankfully lacking any taste for melodrama. All of that comes across in these recordings, which are as arresting and entertaining as either composer could wish for. Sound quality throughout the CD is very good indeed, warm and well balanced, although recording levels are set to low. According to the supplied information these recordings were made "in concert", in which case any audience has been airbrushed out with amazing technical legerdemain. The booklet notes and biographies are fairly brief but informative. In the quaint American style everyone is politely referred to as 'Mr' this and 'Ms' that. Schlefer and Kurosawa are distinguished with a Japanese translation of their bios, but for everyone else it is English only. Collected reviews and contact at artmusiceviews.co.uk.